It may be that you like to see some beautiful scenery, but you’re the skilled walkers: objectively not all have the necessary training. However, you can also see the beautiful scenery along a road in the car. That’s why today we’re going to see the ten national parks in the United States with the best scenic roads ever. It starts from the Racetrack Road in Death Valley National Park in California. You should take a vehicle with four-wheel drive, but if you’re skilled pilots can see breathtaking views, to the Racetrack Playa, a real geological mystery: it is a basin where it appears that the rocks have slipped away, leaving a trace in desert dust. 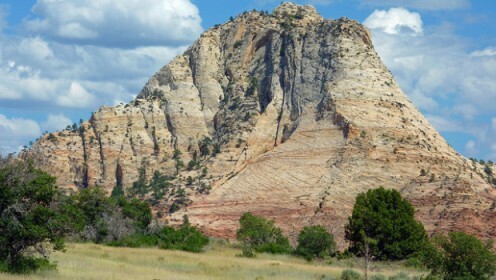 Also try the Kolob Terrace Road in Zion National Park in Utah. The road passes through the upper part of the park compared to the canyon, so you get a different perspective from the usual rocks have different colored bands, strange spiers rising in the midst of pine forests and juniper. Beautiful scenic drives can be found in the Petrified Forest National Park in Arizona: the main street through a petrified forest and offers a spectacular view of the Painted Desert. Visitors can stop anywhere and go hiking in the park, exploring lava formations and fossils. The Cataloochee Valley in the Great Smoky Mountains National Park, offers a road that crosses a historic community, great place to camp and where to fish for trout, for one of the best parks in the USA where you can see animals in the wild. The Park Loop Road in the Acadia National Park in Maine is one of the main attractions of the park. From it you can see both the coast and the mountains, but the suggestion is to take the bus to go along the park, parking problems here are high because of the popularity among tourists. Let’s move in the South Core Banks in the Cape Lookout National Seashore: accessible only by ferry, here you will find a beautiful sandy road with beach attached, are only dunes and sea, sea and dunes. The Tioga Road in Yosemite National Park in California offers a visit to this park less crowded than usual, between granite domes, lakes and meadows. The road winds along the top of the park, with a beautiful panoramic. Now for the Badlands Loop Road in Badlands National Park, the road here is intertwined with important geological formations, who was talking about a surreal, almost seems to have been swallowed up by ravines. The Trail Ridge Road in Rocky Mountain National Park in Colorado is the highest paved road in the country. So it is easy to see that the landscape here is worth a lot of pictures, it seems that the view of the windswept tundra is quite disturbing. Of course there are barriers to prevent accidents. And here you can see many elk. Our journey ends at the Going-to-the-Sun Road in Glacier National Park: a tourism because of overcrowding, here you should use the bus service to the park. Here you can not only admire the beauty of the landscape, but also observe the local wildlife.